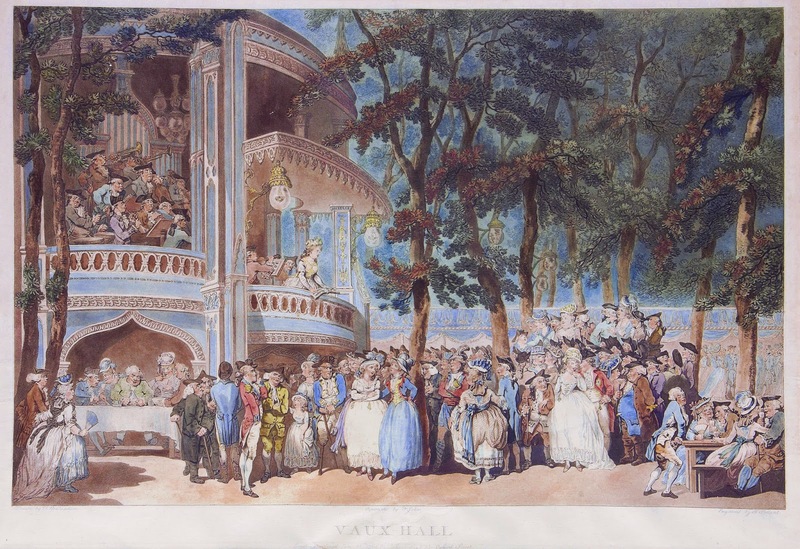 Vauxhall Gardens, a pleasure garden located in Kennington on the south bank of the River Thames, was one of the leading venues for public entertainment in London, from the mid-17th century to the mid-19th century. Initially entrance was free. The owners made money by selling food and drinks. But as its attractions expanded, an admission fee was charged too. The gardens boasted a rococo Turkish tent, a Rotunda, several buildings in the chinoiserie style, a statue of George Frederic Handel, and walks so intricate and private they were often used for romantic assignations. Performances were frequent. Crowds gathered to watch tightrope walkers, fireworks, concerts (the most famous singers and musicians of the day, such as Handel, played there), and hot-air balloon ascents. In 1817, they even hosted a re-enactment of the Battle of Waterloo. All the most popular celebrities of the day could be frequently seen at Vauxhall Gardens. This print by Thomas Rowlandson has immortalized quite a few. In the centre, wearing a white dress, there's Georgiana, Duchess of Devonshire. She's with her sister Harriet, who's wearing a blue riding habit. The two sisters, who were very close, are no doubt gossiping about their acquaintances, who are, in turn, talking about them. Everything the Duchess did interested the papers and their readers. Next to the sisters, we can see Sir Henry Bate, the editor of the Morning Herald, and James Perry (he's wearing a kilt), the editor of The Morning Chronicle, a rival publication. You can bet the sisters' outing at Vauxhall Gardens will be reported by their papers the following day, hopefully accompanied by some juicy bits of gossip, if they can overhear any worth reporting from the ladies' own lips. Farther to the right, the Prince of Wales, future George IV, is whispering something romantic into the gorgeous Perdita's ear. Mary Perdita Robinson and the Prince were lovers, but their affair had ended by the time Rowlandson draw this picture. Next to them stands Perdita's husband, but no one is paying much attention to him. In the dining box, enjoying a hearty meal, is Samuel Johnson, the author of the famous "Dictionary". He's eating with writers Mrs Thrale, Boswell, and Goldsmith. Jonhson's friend Topham Beauclerk, a famous wit, is observing some ladies with his monocle. More difficult is the identification of the performers. Some historians believe the singer to be Mrs. Weichsel, others her daughter, Elizabeth Billington. The identity of the composer leading the orchestra, instead, is certain. He's François-Hippolyte Barthélémon. Can you identify any other celebrity?